The world suffered a significant loss today, the loss of a unique, powerful, gentle, and very recognizable voice. I’m shocked by my own sadness at the loss of Alan Rickman. I don’t think I’ve ever felt the impact of a celebrity death so potently. I always had a little fantasy that I’d someday get to work with him and that we’d get to go to a pub for a beer after rehearsal. It wasn’t a celebrity crush, per se, although I have had plenty of those. My friend, Mollie said it best when she posted on my Facebook wall this morning, “I saw the news when I turned on my computer this morning and thought of you before anything else. It is so hard to lose dear friends that we haven’t had the chance to meet yet.” She gets me. I loved him…the dear friend I didn’t yet have the chance to meet. 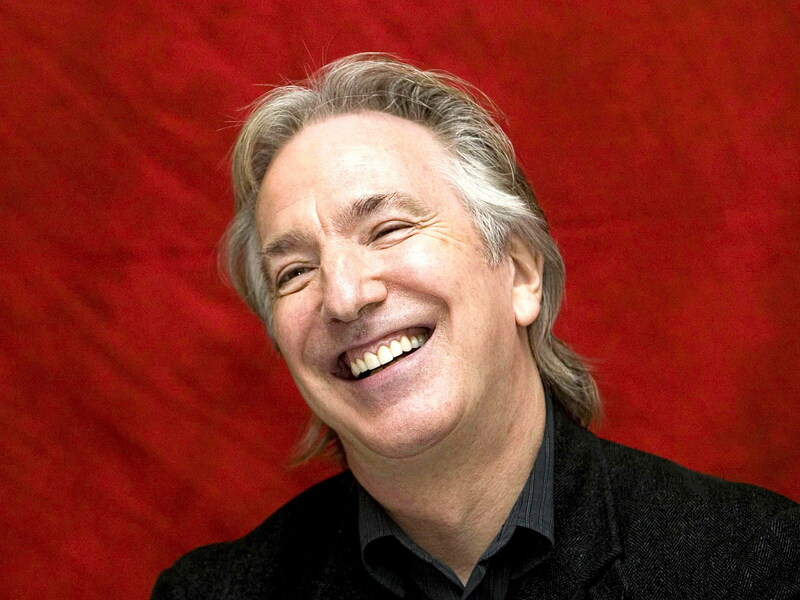 One of my favorite stories about Mr. Rickman is the one he frequently tells of an acting teacher who told him he would never get work…that his voice sounded like it was coming out of the back end of a drain pipe. In British terms, I think that means it sounds like it’s coming from the sewer. He was also told he had a spastic soft palate and terrible diction. Some of these criticisms are things that can be corrected through hard work and study, but as he has said, some just have to do with your own personal architecture and the way you are built. These unique physical characteristics give each of us our own, unique sound. These criticisms provided him with massive obstacles to overcome. Not that his voice was an obstacle exactly, but his own perception of his voice and the opinions of others that his voice was a problem. As we all know, our voices sound much different inside our own heads than they do on the outside. He has said that it is always a shock to hear his own voice. He never got used to it. Yet, he was compelled to use his voice as a performer and he was compelled to give voice to the voiceless as a political activist and playwright. Criticism of our voices is probably a universal experience, and more far reaching than whether or not a person chooses to perform. We can shut down our opinions; stay quiet when we want to speak up for what we believe in. Little girls are called “bossy” when they exercise the power of their voices. Little boys are called “sissy” when they choose to stand up for the marginalized. Some of us were told that we couldn’t sing, that our voices sounded bad, or were teased that we couldn’t carry a tune in a bucket. Some of us were told our voices sounded like a sewer pipe. Many of us made a choice in that moment, because we never wanted to feel that way again, that we would not speak up or sing out. In that moment, the world suffered a significant loss. Each Thursday evening from 7-8 PM is an opportunity for you to lift your voice. We are working on simple songs in a safe space, with wine, and with others who believe that your voice, and their voices, matter! If you would like to join us, let me know and I will give you the details. Jane, you certainly have found your voice in the written word! 🙂 You’ve recognized a limiting belief and you have overcome it. Keep singing! It is your birthright. Love this post. I’ve heard so many stories of people overcoming massive obstacles. Brilliant actor and some of the best advice! Wonderful insight! It’s interesting how those things that are different about us, often things we’ve been made to feel insecure about in our youth, are the very things that can help us stand out in a positive way if we have the courage to continue to do what we love. So true, Grace! Courage is a key component to using our voices. What an amazing post. I’ve always hated my voice. I often think it sounds so annoying, why would anyone want to listed to me? But yes, people do want to hear what I have to say 🙂 Alan Rickman will be sadly missed, as will David Bowie (who DID have an amazing voice). Yes, we do want to hear what you have to say! Your blog helped me continue to prioritize balance and my health this week. Your voice is making a difference! Ha…as a little girl I truly wanted to be a singer. But it is true in that I am pretty much tone deaf and cannot remember words to songs. So as with many other things that was out. But I still sing – at least to myself and thoroughly enjoy it. That being said…we all do have a voice whether it be for singing, for narrating or any number of other things. Love this post! Singing is your birthright. 🙂 And writing. You’ve absolutely found your voice in writing. I was one of those people who was told I couldn’t sing to save my life, by my choir teacher. (I’m paraphrasing, because who remembers the fourth grade?) Even though I didn’t plan on singing for anything other than fun, it put a big dent in my already fragile self-esteem, and over 20 years later I am still scared to sing around other people. I love hearing that Alan Rickman story because it reminds me that one opinion doesn’t make it true. We’ll miss you, Alan Rickman. Ashleigh, stories like that break my heart! You are so right…one (or even many) opinion doesn’t make it true. My mom’s was the first story like that I’d heard, and she has a beautiful voice with excellent pitch. She loves to sing but would never join even her church choir for fear of being heard. Now, in her 60’s, she’s been to my choir twice and she’s singing out loud! I’m so proud of her! I didn’t know this about Alan Rickman, I feel like I need to go and check out all his work and interviews now. I like what you say about how your voice matters. I sing in two bands, I’ve always sung like no ones watching me and it gives me so much joy. I’ve been lucky enough to have had a natural talent from a young age but I’ve certainly developed my voice through hard work too. To use one of Alan’s quotes “Talent is an accident of genes – and a responsibility.” – I like that and truly believe it, that’s why I’ll never give it up. Very cool, Deb! I so agree. Are there any professional performers who have not developed their talent with considerable skill building? Using the “talent” excuse is another way people choose to hide their voices, believing that the skills of those they admire are really talents and therefore out of reach. Wonderfully written post! I love how you interweave Alan Rickman’s story to communicate your inspiring message. I agree that there’s great power in taking ownership and sharing our unique voices. I imagine doing so may not be easy against a backdrop of fear and self-doubt — but certainly not impossible with the right support! What a great example of someone who placed their purpose ahead of their obstacles. Alan Rickman had such a powerful vision for himself and how he wanted to serve the world. He truly lived the example that our voice does matter. Thank you, CherylAnn for sharing a bit of Alan’s legacy. It’s beautifully written. I know he would have loved to have met you. I love the way you put things, Michael! “…someone who placed their purpose ahead of their obstacles.” Now, that is inspiring! Thank you. I love this post because it goes far beyond the realm of just singing… it goes into sharing one’s story, or anything about oneself in general. Our voice matters and deserves to be heard and appreciated. We all have something one-of-a-kind to bring into this world, and no one should ever tell us that it’s not good enough. 🙂 Thanks so much for sharing. “Always.” So true! Thank you, Lehua! I’m not a singer and I’m quite self conscious about my voice- you know how it sounds different when you hear your own voice! Anyway I do want to get into public speaking so I’ll need to work on that! Yes! I think that many of us need to experience some desensitization about the sound of our own voice. I make my living through music, both teaching and performing, and I still am caught off guard by recordings. But, I will attest to a growing objectivity over the years due to having to hear recordings of my own voice. I highly recommend the practice! You'll be the first to know of upcoming recitals, fun musical community events, and more!